The Svalbard Global Seed Vault is much more than a failsafe for end times. The Global Seed Vault may seem like a failsafe for end times, but it’s actually a reminder that the world is always ending. The Svalbard Global Seed Vault provides a safe backup of seeds for food crops conserved worldwide. This picture from inside the vault shows shelves with boxes holding samples. In his recent novel Normal, Warren Ellis imagines a refuge from the world, a safe space tucked away in the Oregon forests. Somewhere between a private resort and a mental hospital, it provides sanctuary to a small and extremely specific clientele: futurists who’ve spent so long contemplating emerging dangers that they’re no longer able to function in ordinary society. Freed from computers and phones, they try to reboot their souls, clearing their caches of accumulated anxiety while walking in the shadows of ancient trees. Things go off the rails quickly, of course, but I still found the premise appealing, not least of all because I sometimes write about “existential threats,” forces that menace human existence as such. Though my role is often to comfort—no, I would write, killer robots aren’t going to murder you—merely contemplating such questions can be exhausting. Spend enough time gaming out the apocalypse and you’re bound to come away drained, whether or not you decide that the end is imminent. For a while, my own real-world version of Ellis’ fictional retreat was the Global Seed Vault on the Svalbard archipelago, part of a frigid cluster of islands far north of Norway where polar bears outnumber human residents. It’s a destination I first discovered in Lauren Redniss’ remarkable illustrated study of weather, Thunder and Lightning. There, she writes, you’ll find the vault, a reinforced and heavily secured tunnel, built into a frozen mountain. It contains hundreds of thousands of unique samples of agricultural crops and serves as a backup repository for seeds from more local vaults around the world. The collection is so inclusive that, as of 2016, virtually every country was represented within. In photographs, the vault’s exterior is strikingly beautiful, thanks in large part to the haunting crystalline light installation by Dyveke Sanne above the entrance. 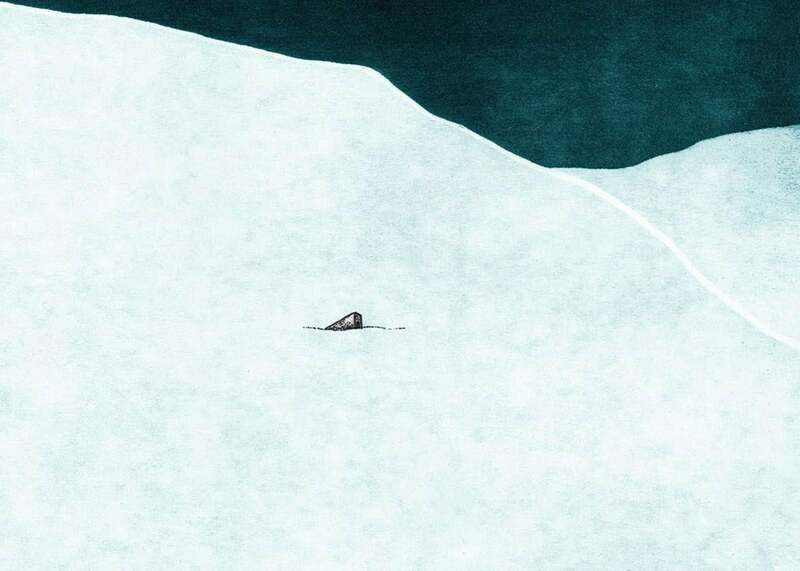 When Redniss draws the vault, though, she emphasizes just how small it is, a tiny gray wedge emerging out of the endless white expanse of the mountain. It’s an image of resilience in the face of almost overwhelming odds, a reminder that, much as our species is capable of self-annihilation, we somehow incline toward survival. Sometimes, kept awake by my work, I would tell myself stories of Svalbard. They always began the same: Long after the fall of industrial civilization, an adventurer would discover mention of the Seed Vault in the ruins of an ancient library. Gathering a ragtag crew and building a makeshift longship, she would sail north, in search of treasures that might help her people learn to farm again. Along the way, she would battle pirates and dodge errant ice flows. My adventurer never arrived at the vault: The mere knowledge that it was there, that she was traveling toward it, was reassuring enough to lull me asleep. Though such facts are reassuring, the Svalbard vault was never really designed to support life after the end—at least not in the singular, definitive sense that “the end” suggests. As Fowler stresses in Seeds on Ice, the vault was envisioned not out of an obsession with “doomsday” but in a more “pragmatic” spirit. It exists in an ongoing relationship with scores of local seed vaults around the globe, helping them protect their critical contents against the risk of more regional and immediate disasters: floods, power failures, violent uprisings, and so on. The Svalbard Global Seed Vault, in other words, is part of a system, a network of interlocking efforts designed to sustain us here and now. Almost inevitably post-apocalyptic fictions, including the stories I tell myself as I’m falling asleep, are actually reassuring fantasies by other means—dreams of survival even in the face of whatever might be coming. The Global Seed Vault, by contrast, is a practical reminder that there is no single refuge against our already apocalyptic times, no one safeguard against the chaos that’s already here. Instead, it demonstrates a vital and unavoidable truth: The world will not end, but it is always ending. To acknowledge this fact is not to call for quietism. Inevitably, extreme apocalyptic thinking blinds us to the everyday crises that we already face. We see evidence of this tendency in research indicating that temperate weather leads us to ignore the reality of climate change, even or especially when those mild conditions are abnormal. Anticipating catastrophe, we look the other way when we’re faced with calmer crises. Expecting such a conclusive conclusion renders us impotent: What crops could sprout in tomorrow’s scorched earth? What, then, can we do today? The Global Seed Vault offers us something else, not hope so much as an antidote to our helplessness. Where we can only ever surrender to end of the world, the many ongoing ends of the world are action items in the making.